You’ve heard it said before, planting a tree is a simple yet powerful act. While that’s true, your commitment should make the biggest impact possible. So, before you plant, take a look at these important resources. Tree ID: Urban Tree Key – This is a resource to help you identify tree species by asking you a few observational question about the tree. In addition Dr. Matt Ritter published a book, “A Californian’s Guide to the Trees Among Us.” This book features 150 tree species that are commonly grown in California. SelecTree – This program designed by the Urban Forestry Ecosystems Institute at Cal Poly is a tree selection database for California. You can find the best tree to plant by attribute or by zip code. Not every tree is suited to your city’s climate or even to an urban environment. Right Tree, Right Place – When you plant a tree, you hope to see it grow to maturity. Make sure that happens by planting the right tree in the right place. This site provides valuable resources to make sure that your plan to plant takes health and safety risks into account to help avoid future conflicts. Also check out TreePeople’s DIY page, materials are in English and Spanish. Tree Quality Cue Card – When you get to the nursery, the information from the Urban Tree Foundation on this cue card will help you choose the best quality tree stock to plant. The card is available in English or Spanish. Additional Resources – There are several books that can teach you more about the trees available in California. Check out A Californian’s Guide to the Trees Among Us by Matt Ritter to learn more about California’s most common street trees. The Sunset Western Garden Book can tell you more about your area’s hardiness zone and appropriate plants for your climate. By planting a tree, you’re planting shade, fresh air, clean water, and a healthy community. To make sure your tree grows and provides all of its possible benefits. Here are tree-planting videos from two long-time urban forest nonprofits: Sacramento Tree Foundation and TreePeople in LA. Pedestal Method – This method was pioneered by Sacramento Tree Foundation for planting in clay soils.This method will protect the root ball of newly planted trees from excessive water. 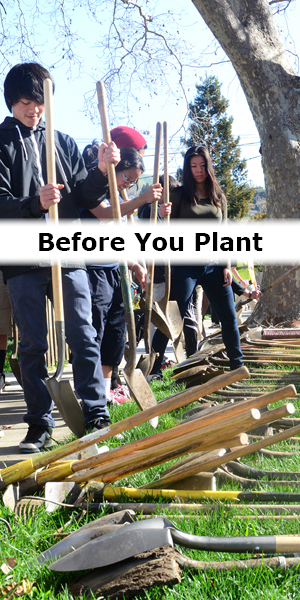 Tree Planting Cue Card – When you’re ready to plant your tree, you can take this card from the Urban Tree Foundation with you to make sure you remember the important steps you can take to help your tree get the best start possible. The card is available in English or Spanish. Once your tree is planted, your job isn’t done. 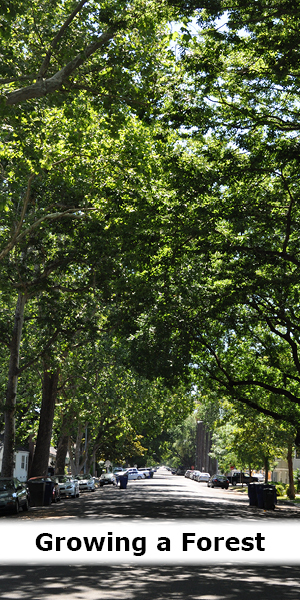 Trees in our cities and towns have different needs than those growing in a rural forest. With just a few simple acts, you can ensure your tree lives as long as possible. Watering – Young trees should be watered deeply once a week to encourage deep root growth, but trees’ watering needs vary based on a tree’s age and location. For the best advice for your area, find your local California ReLeaf Network member or read our general tips for watering. When drought conditions prevail, remember, you can Save Our Water and Our Tree! Pruning – Pruning your tree for the first two to eight years after it’s been planted is recommended to gradually create good structure and form, here is some information on why pruning is important. For the best advice on how to prune your young tree, use the tree pruning cue card. The card is available in English or Spanish. 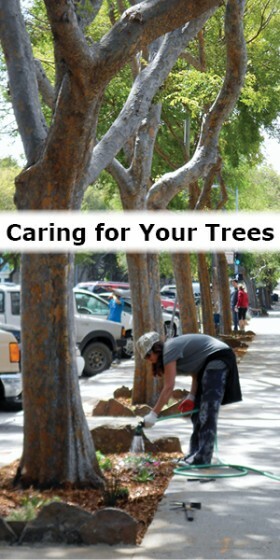 Mature trees care – Provide people with the most benefit in an urban settling. Here is a general guide on mature tree care. When Should You Hire an Arborist? – An arborist is basically a tree care specialist. For the same reasons you wouldn’t trust the management of your health or of your retirement investments to just anyone, mature trees are best handled by the pros. Tree work can be complex, and sometimes dangerous. Certified arborists will know the smartest and safest approach to caring for your tree. They are also skilled at preventing potential mistakes or hazards since they have a complete understanding of tree biology and structure. To find an arborist you can trust, browse the listings on the International Society of Arboriculture’s website. An urban or community forest is all of the trees, plants, and natural resources within a city or town. The trees, parks, trails, streams, and green spaces in your community – even the trees you’re planting – are parts of the urban forest. Why Trees? – Trees are an important part of any environment, but make a huge difference when they’re planted and cared for in urban areas. Take a look at this infographic and explore our site to find out more about the benefit of planting trees in our cities and towns. Our Collective Impact – Planting a single tree can make a difference for your family, but planting a forest is an act of great compassion for your community. When you plant a forest, you plant clean air and water, shade, places to heal, and places to play. When you plant and care for an urban forest, you’re growing community and connection. Sound daunting? 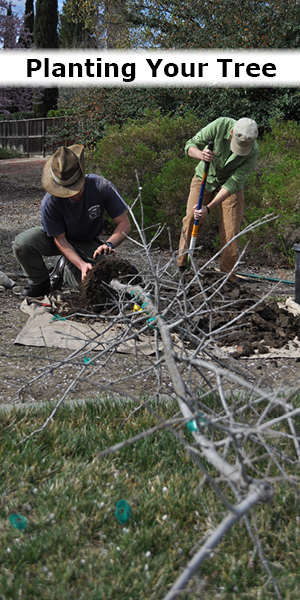 At California ReLeaf, we’re working hard to grow forests in communities throughout California. You can join us in this effort by supporting California ReLeaf.